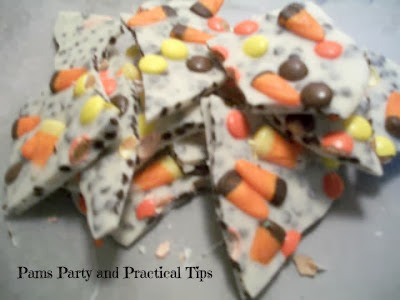 Use your leftover Halloween candy and make a colorful Thanksgiving treat. We made this last night and the family LOVED it. For our bark I used a bag of Hersheys Cookie and Cream candy bars that I bought on clearance, and with a coupon at Target. 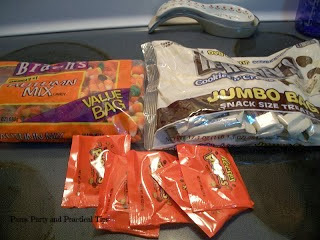 I also used Autumn mix candy corn, and a few bags of Reeses Pieces. 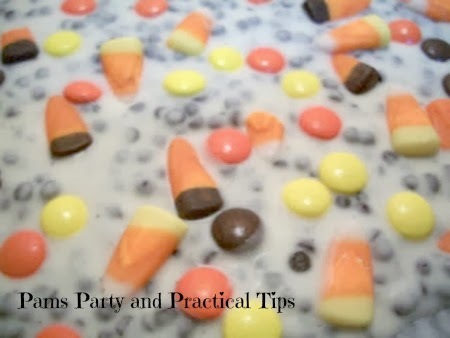 Candy bark is super simple to make, and can easily be changed to your color and flavor preference. For Thanksgiving, I thought a good color combination would be white, brown, orange and yellow. I melted the chocolate bars in the microwave using the 30 second method. Melt for 30 second intervals, stirring each time until all the chocolate has melted. It only took me 2 minutes total for the entire bowl of chocolate. 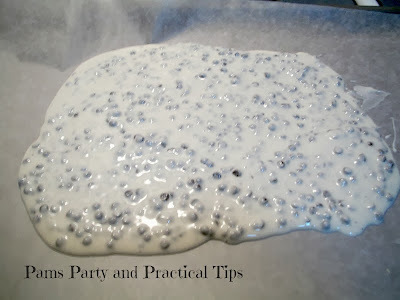 Lay a piece of wax paper on a cookie sheet, and spread the melted chocolate mixture onto the paper. 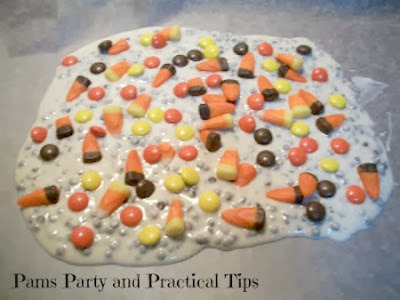 Add your favorite candies to the chocolate mixture. Place in the freezer for about 15 mins to harden and to give the chocolate a nice shine. Once the candy has hardened, pull from the wax paper and break into smaller pieces. Can't wait to try your bark - so colorful! Thanks for linking up! I am thankful! That looks deLICious! And so festive! Can I beg you to share it here? 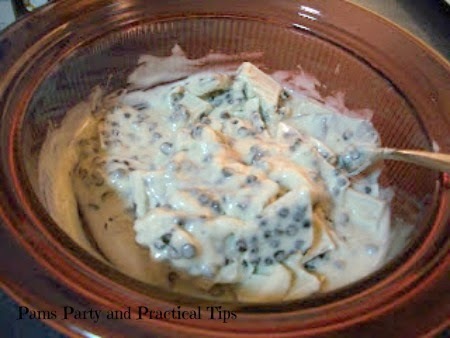 I would gobble this up =o) I love that you used Cookies and Cream candy bars instead of just plain white chocolate! Ooooo These looks amazing.. YUmmmy...So Perfect turn out and soo festive for the season.. I would LOVE for you to please share it via my thanksgiving linky party pweease. - http://theartsygirlconnection.blogspot.com/2011/11/thankful-for-food.html?showComment=1321294226362#c4607478653202832991 TY -- wishing you an amazing start to your weekend.. In could just gobble this all up! Stop over and link up any Thanksgiving Crafts and Recipes at my new link up. I"d love to have you! Mmmmm this looks & sounds SO good! These look super yummy! Come over and link up to my Must Try Mondays. I LOVE the reese's pieces :). Thanks for linking up! I'm so glad to have these on my blog! What a wonderful idea! My kiddos would love this! Thanks for sharing. I love this and I'm definitely going to be making this soon! We'd love to share this with our readers...would you please link up with us today for Fun STuff Fridays? YUMMY! If you get a second, I'd love to have you link up to my party at http://scrapbookingez.blogspot.com/2011/11/anything-goes-linky-party_17.html. Thanks for sharing! this looks yummy! what a fun way to use up that leftover candy too. This looks sooo yummy.. my little candyaterians would love this! Thanks so much for sharing wiht the Pink Hippo Party.. can't wait to see what you share next! Thanks for sharing! looks yummy.